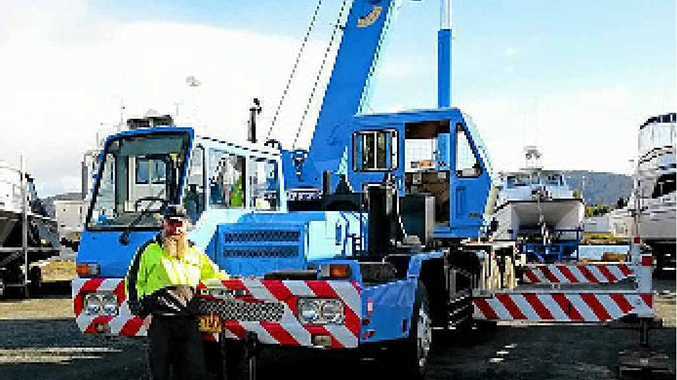 PASSING by Triabunna the other day we caught up with Steven Bird from Hobart loading an eight tonne, 20 metre, fishing vessel onto Ken Johnson's trailer for the journey to Gladstone in Queensland. Steven had been having quite a time of it on a freezing cold and windy day, getting the boat positioned correctly, but was looking forward to the journey back to Hobart and a hot meal. He was driving an Elliott's Crane Hire Nissan UD with a Tadano 25 tonne SWL extendable to 31 metre crane, and tells us he has been with Elliott's for four months or so now, and that he is thoroughly enjoying the job, working pretty well statewide, and with a lot of variety plus good gear.